I had an opportunity tonight to use iPhoto ’11 for the first time, and I’m generally pleased with the software improvements. One of the things I’m happiest to see is better uploading integration with and publishing options to Flickr. 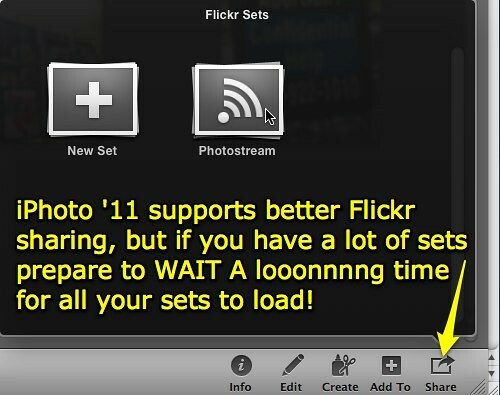 After selecting a photo or group of photos in iPhoto ’11, choose SHARE – FLICKR in the top menu bar or click the SHARE icon in the lower right corner and choose Flickr. Unlike the previous version of iPhoto, which only uploaded smaller versions of photos to Flickr and forced users to create new Flickr albums using the same names as their enclosing iPhoto albums, iPhoto ’11 provides more options. Images can be uploaded separately to your photostream but NOT included in a set. If desired, photos can be added to an existing set or a new set can be created. The program seemed a bit sluggish and slow to respond on my computer this evening. Part of that, I’m sure, is the fact that I have so many Flickr sets on my account and it took awhile for iPhoto to load the most recent ones. It also seemed, however, slow to delete images from photo albums and VERY slow to complete the uploads to Flickr. You can opt to upload full-resolution versions or 1024 x 768 versions. I tried both for different photo sets. Another thing I like is the geo-tagging, which was supported in the previous version of iPhoto but seems to have a more prominent space in the program’s display. Since I take most of my photos with my iPhone, geo-tags are automatically added to my photos. These are shown in iPhoto, but NOT shown in Flickr when I upload images. 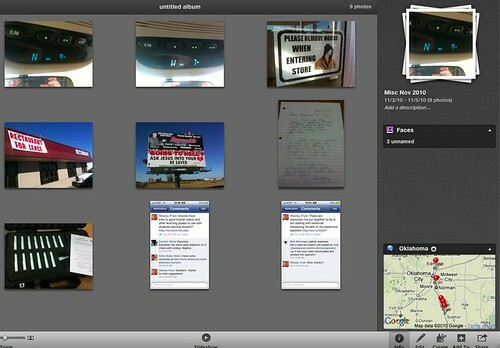 I thought I read somewhere iPhoto can upload geo-tagged photos to Picassa, but I can’t readily find that reference. I’m not a Picassa user, so that doesn’t help me much. I’ll probably stick with using the Flickr Uploadr in the future since it DOES support geo-tagging. Hopefully an iPhoto ’11 update will be released which will not only improve the performance issues, but also permit uploading of Flickr photo geo-tags. In the iPhoto ’11 screenshot below, you can see some of the photos I took last Wednesday when I drove from Denton back to Oklahoma City. The map pins along I-35 where I snapped my photos including this ridiculous billboard line up nicely on the map in the lower right corner. Have you had a chance to play with iPhoto ’11 yet? What are your first impressions? I had bought FlickrExport (http://connectedflow.com/flickrexport/) for a previous version of iPhoto. Like you, I have a bunch of flickr sets. FlickrExport worked rather quickly. I think it was like 19 dollars or so. I haven’t tried the built in flickr upload support. I like the new themes for slideshows and the different music but I don’t like how the full screen isn’t really full screen because you still get a preview of other photos. I am too scared to see if I delete a photo does it delete the photo from the Facebook or Flickr set? I will try an upload and see what happens. I agree with you in that sharing with iPhoto 11 is much better, and they continued this trend with the other iLife apps. too. I love the fact that iMovie 11 allows you to share to online streaming communities like YouTube and Vimeo now with one click. I think I’ve worked out why it took so long. It’s actually downloading your Flickr sets the first time you synch with Flickr. I now have my Flickr sets on my new MacBookAir which is quite nice. It downloads the key photo of past sets and then when you click on it it then downloads the rest which may take some time. Was that always there? I never noticed before. Is this new tool; just sharing and uploading or for example if you delete per accident a photo set in iPhoto will it due to the share also be deleted on flickr? If thats the fact then you cannot use this tool for backup. I don’t think, based on what I know currently, I’d recommend using the iPhoto hooks to Flickr as a means for backing up your photos. I’d recommend using both a local, fast, large external hard drive to backup your photos and also a cloud-based backup solution. I’m a MobileMe subscriber but don’t use it for backup, I need to start using a cloud-based backup solution but haven’t taken that plunge yet. Yet!